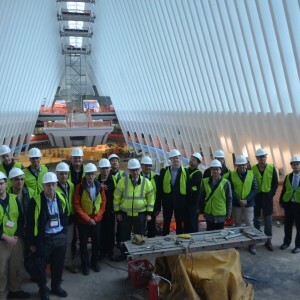 This tour, organized by The Port Authority of New York and New Jersey, began with the group assembling within the Lobby of 4 World Trade Center and after introductions, the group was led through the work site of the now rising 3 World Trade Center to the eastern end of the Santiago Calatrava-designed transit station soon to serve as a transportation and retail hub for Lower Manhattan. 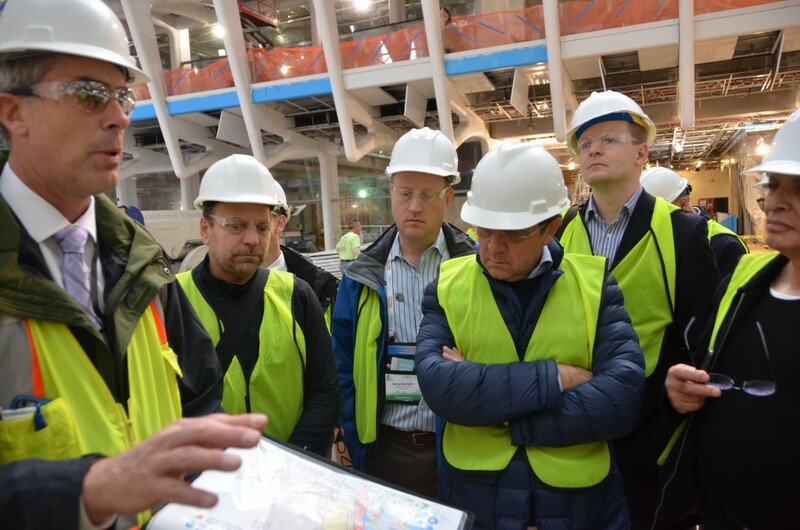 Upon the visit, the main hall was very close to completion, with an expected opening in late 2015 or early 2016. The expanse of the main hall is the size of a soccer field, approximately 300 feet long and 150 feet wide, a grand civic space designed in remembrance to the lives lost on September 11, 2001 and is expected to rival Grand Central Terminal in Midtown as a prime gathering spot for New Yorkers. 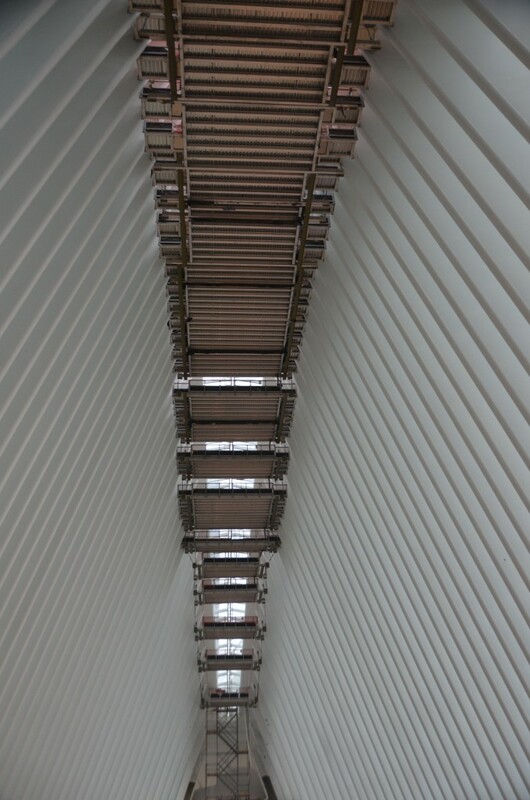 The bottom of the main hall is located two floors below street level and is capped by an aboveground structure made up of 12,500 tons of steel, framed of steel ribs with each assembled from five separate parts. 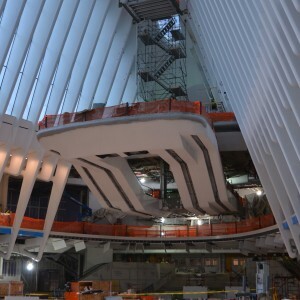 The center of the hall’s aboveground span has a 22-foot-wide “oculus” running the entire length of the hall and is enclosed with a retractable skylight that will allow natural airflow and direct sunlight to spill into the main hall at exactly 10:28 am on September 11, the very moment of the first collapse at the original World Trade Center. 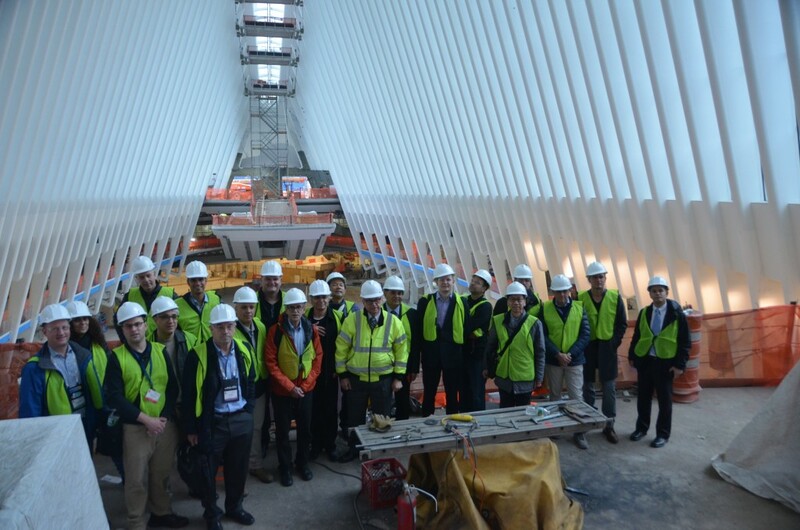 While Calatrava himself was said to be onsite that morning, the group did not have the pleasure of crossing paths with him. 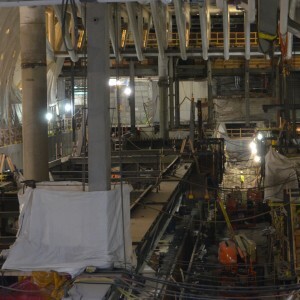 The Port Authority of New York and New Jersey is also working on the neighboring museum and mentioned that the transit center has up to 1,000 workers onsite daily. 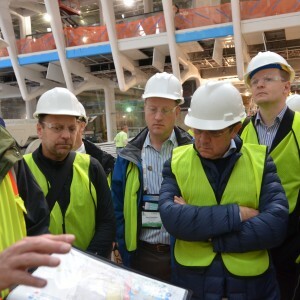 The work crews began each morning with daily meetings to discuss tasks to be performed on the unconventional construction project, which required major training to produce proper welds for the unique steel structure. 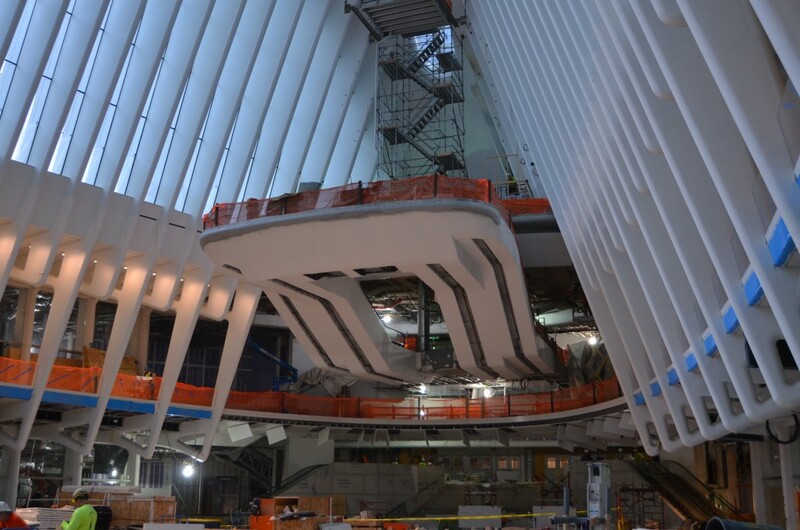 The steel was then coated in intumescent paint to allow the structure to be exposed while still meeting required fire ratings above street level. 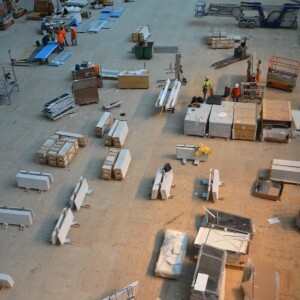 Plywood was spread across the floors of the hall and the retail mezzanine flanking the perimeter to protect the imported Italian white marble floors during the last phases of construction. 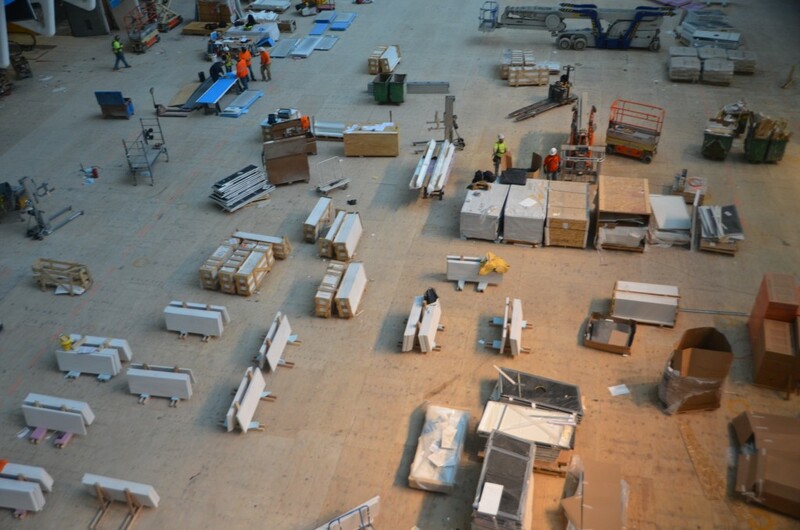 Acoustical panels in the ceilings surrounding the hall keep echoing to a minimum within the grand space. When originally designed, much of the interior illumination was intended to be typical incandescent and fluorescent lighting, but throughout the duration of the project LEDs became far more economical and lighting plans were changed to accommodate more energy efficient fixtures. 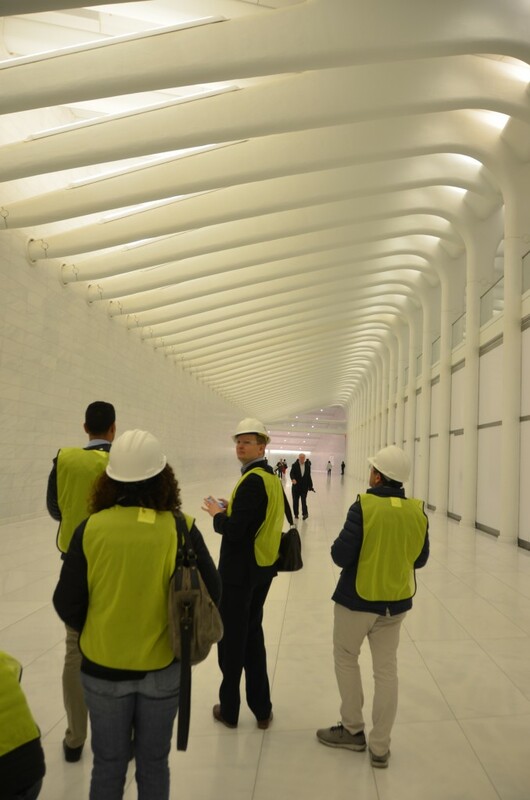 It was mentioned that the retail concourse of the Original World Trade Center functioned as the “second busiest mall in the country” and as such, the new transit center contains just less than 500,000 square feet of high-end retail, to be managed by Westfield. 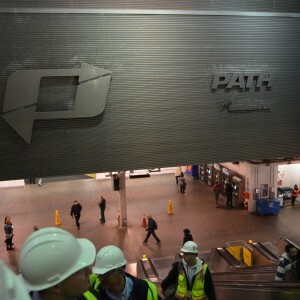 It easy to understand why this location would naturally be a busy place for shopping as this juncture has 100,000 passengers of PATH and subway trains walking past the worksite each day, currently funneled between two plywood barriers separating the public from the main hall and the yet-to-be-finished platforms of the PATH terminal. 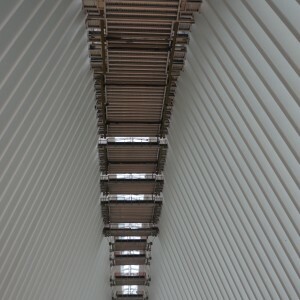 As the group descended a grand staircase upon leaving the main hall, the group walked below the Line 1 subway tube, suspended by a truss structure and making up the ceiling of the connecting area between the main hall and the PATH platforms. 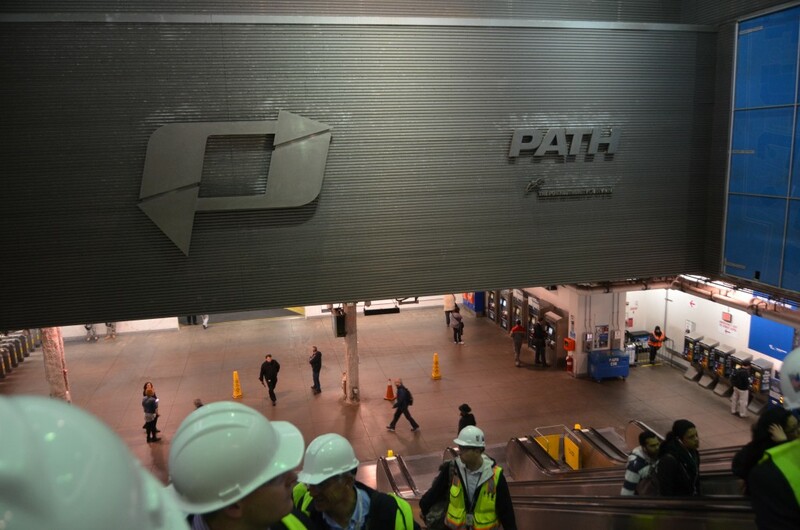 We were then shown the unfinished platforms by walking into a portion of the former temporary station set up after the collapse of the original World Trade Center. 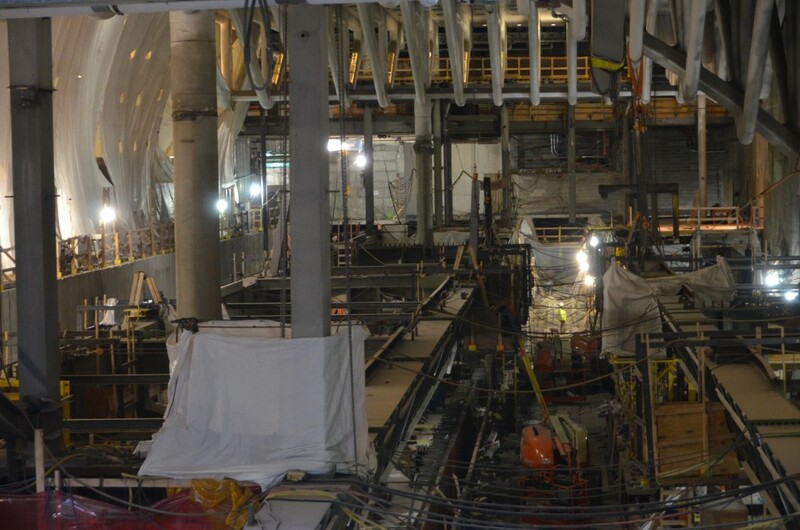 The temporary station steel structure was cut away, allowing the group to gaze upon a view of the new World Trade Center towers from a vantage point which soon won’t be visible again.